And stood at William's feet." 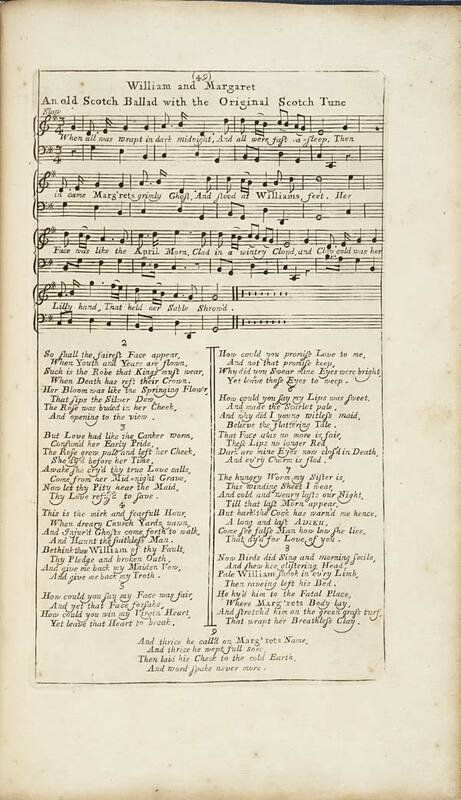 This song, along with many other, became popular among the Scottish people, and was carried with them wherever they settled. When many Scottish immigrants came to America, and settled in the remote Appalachia Mountains, the song was brought with them. 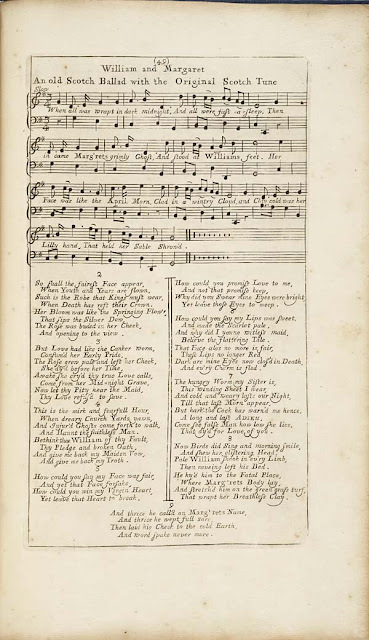 The song was sung by many, and eventually became so varied due to the changes from various singers over generations, that the now different songs only carried the same basic themes. But what a theme it is. It's a dark love story between a maid and William, who is implied to be a man of wealth and upper class. Sweet William tells Fair Margaret (the maid that he's in love with) that he is marrying another. She sees the bride and William together after the wedding and runs off to kill herself, because of how badly her heart has been broken. Her ghost comes into his bridal chamber and ask him if he loves his new bride, William replies telling Margaret that he loves her much more than his bride. William wakes in the morning saying he had a bad dream and in which he saw Lady Margaret's ghost and goes off looking for her. All he finds is her body in a coffin. In some versions, soon after the death of Margaret, William kills himself too. They are buried beside each other and a rose grows from her grave and a green briar from his, ultimately becoming entwined and forming a "lovers' knot". In fact there are over 50 different versions of this song, going back all the way to the 1600's and newer versions still being found as recently as 1995. Now please forgive the quality of this video, and the horrendous singing, but I wanted to share my favorite version of this song. Maybe one day I'll get up the courage to sing it in camp, along with other period songs....but for now, I'll just do this, and see what people think of it. I love songs like this. There is nothing that can compare to this day! I think I always learn something when I see your blog, that is one of the things I love about it. Great job on your version of the song. Wow, you have a beautiful voice, and make the song come to life. Lovely voice and beautiful song. Well Done! What a beautiful song! As I was reading the post I kept thinking, she has to include a video of the song. I didn't expect to get to the bottom though and see a video of you singing it. Oh how I love your blog and so glad you posted. What a beautiful song! I can sing in choir but I can't sing on a video. LOL Be brave, sing in camp next time! You have a beautiful voice!! Thanks for sharing. If you think your voice is horrendous then mine could break glass lol! thanks for sharing the Lady Margaret Song! Beautiful rendition! Thanks for the history too!